Web Components: Encapsulated and reusable components for the web. Reducing number of DOM nodes to those needed at runtime. modularized and organized code: less prone to errors. Reusable interface elements and functionality. Easily open sourced: share interface elements/code between projects/developers. template (n) - A document or file having a preset format, used as a starting point for a particular application so that the format does not have to be recreated each time it is used. No side effects: scripts don't run, images don't load, video doesn't play until template is used. Placable anywhere: head, body, iframe. Designers can create rich web user interaction (UI) using CSS and HTML markup only. Developers can focus on integrating the design elements. <content>: insertion point that projects the text from the shadow host to shadow root. 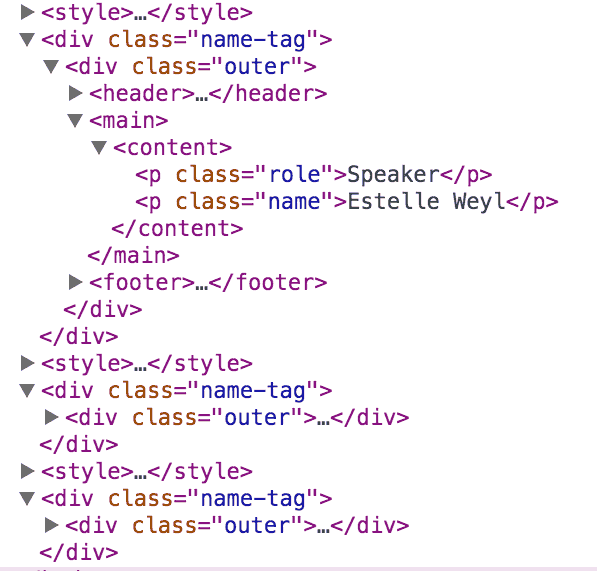 <content select=".classInHost"> looks inside the shadow host for any element with a matching class of .classInHost. 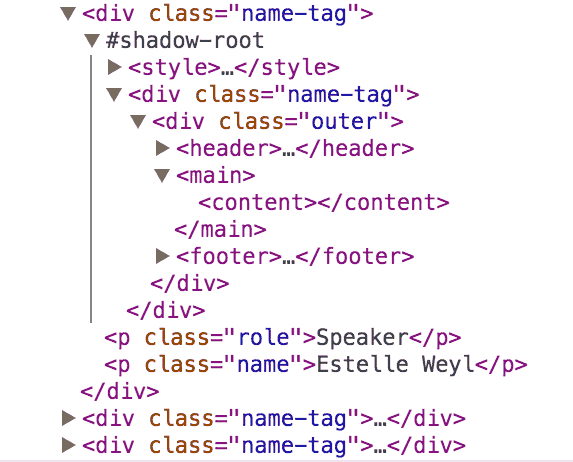 If an element in the shadow host has the class of classInHost, its contents will be rendered in the shadow DOM. shadow root: 1st node of your shadow tree. Ancestor to all other nodes in the tree. Shadow host content is not rendered. Rather, shadow root content gets rendered. Shared dependencies are only loaded once. Import has to be same origin, or CORS. Name the element: all lower-case and must contain a U+002D hyphen. 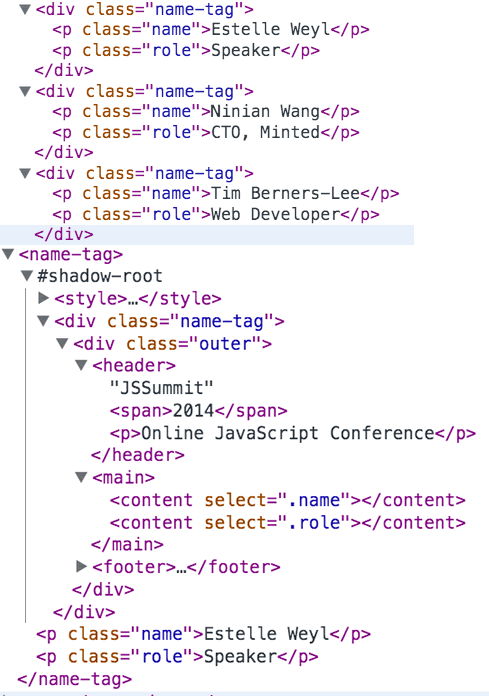 The custom element that you import creates a shadow DOM from a <template> then registers itself. Imports can execute script, so use imports to define and register custom elements. invoked after custom element is created, registered and prototype set. custom element's attribute is added, changed or removed. yourButton.textContent = "I am extended"